His name was Rodeo and rodeo was what he did best. French Streaktorodeo, an 8-year-old AQHA bay roan stallion, was owned by Corny and Maria Wiebe of Alberta, Canada, but loved by Colby Gilbert. 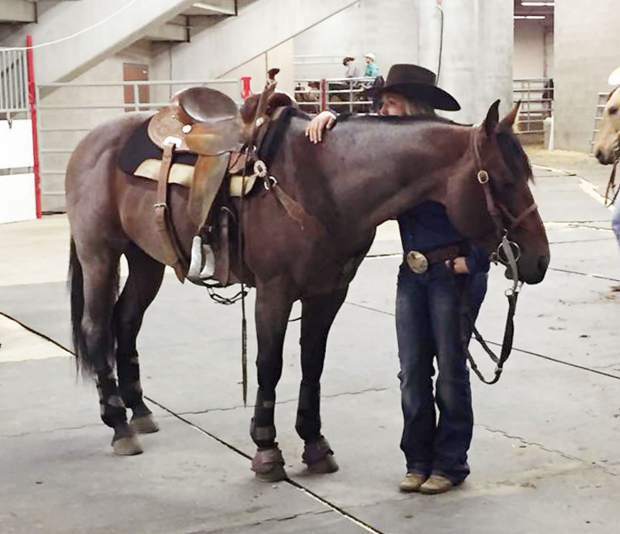 The pair competed in barrel racing and qualified for Canadian Finals Rodeo this year and The American last year. Their career was cut short when Rodeo escaped his pen and caused internal damage trying to get into a pasture. He was rushed to a vet in Saskatoon, where he awaited surgery to repair a basketball-sized hernia, but once in surgery, his colon ruptured and nothing could be done. He died Oct. 31. Gilbert was connected with Rodeo through her mom’s training connections. A mutual friend between Gilbert and her mom Andrea Udal and Rodeo’s owners linked the duo. The Wiebes wished to try Rodeo in the barrel pen and Gilbert was their gal. Corny had always wanted a piece of that popular performance bloodline and Rodeo was it for him. The son of Streak of Fling was born at Fulton Family Performance Horses, and went through their sale in front of Corny’s eyes, but he didn’t bid. He later spoke with Brian Fulton and he directed him to Rodeo’s new owner, from whom Corny purchased the horse. “He made my dream come true. I had always wanted to own a Streak of Fling offspring. He had a really amazing personality and loved whatever you were trying to do with him. He loved the job and was never one of those horses that didn’t want to do what we wanted him to do. I liked the way he did everything,” Corny said. The Wiebes offered Rodeo at stud for three seasons, and reported great results from his offspring. They hope to acquire a filly by Rodeo for their breeding program. Gilbert is heading into Canadian National Finals without Rodeo. She will rely instead on a five-year-old mare owned by her mom, and also her traveling partner’s horse. Rodeo was loved by all those surrounding him right up to the end.